I only have about a month of experience. I am Trying to build a software install package to deploy. I have made two others previously with no issues. 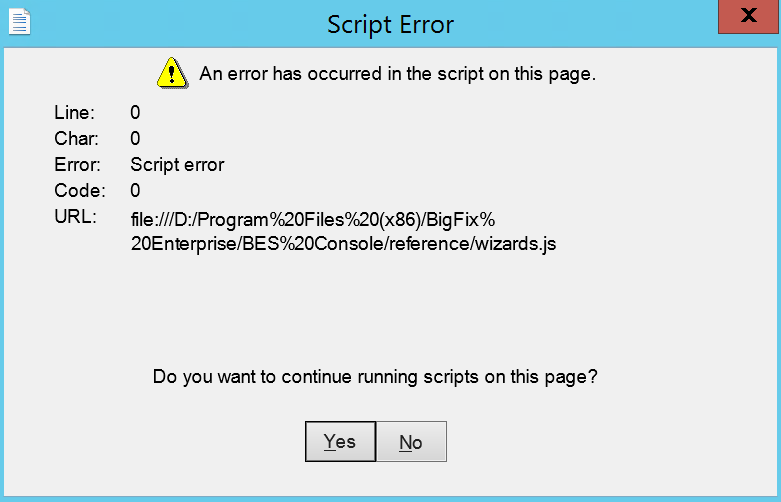 This time I continued getting “Script error” with my source file when I would try and click “finish” in the wizard. I was using the correct pathway; I:\8_Software\Citrix Reciever\4.10.1\CitrixReceiver.exe Does anyone have any advice on what the issue could be or what I can do differently? Type here. Use Markdown, BBCode, or HTML to format. Drag or paste images. This is the error Message when I try and finish the wizard. Download error: "Error processing completed download: Requested sha1 4e15e0f9a2221388717821affea126ae5bccbf96c9558ed596ae6fc61fc1de6d does not match actual sha1 a9766306f1f2900dfc5b489c24b8afc850f0a50e"
Not sure about your first issue. The script error is a generic error and it’s possible that something went wrong. A easy way to test is to clear your BES Console cache and restart the BES Console to see if it happens again. That error means the downloaded file’s sha1 doesn’t match the expected. Looking at the URL, it doesn’t look like a standard file URL but a redirection URL. BigFix doesn’t handle those properly. If you’re trying to download a specific file, you need the actual file URL; not a redirection one. This should be the proper one: https://downloads.citrix.com/14181/CitrixReceiver.exe?__gda__=1518474812_4674025f3f4cda2c40c5d88bdc7e4ae5, however, it looks like there’s a session token involved so I don’t know if it’s reliable for you to use. If Citrix requires an authentication session for their downloads, you will have to precache the download manually (similar to the Java fixlets). The simplest way to do this is by using the Software Deployment dashboard to generate the fixlet. The wizard will upload the file from your console computer, store it beneath wwwrootbes/Uploads, and create a fixlet with a download command to retrieve it from there. It looks like you were trying to use the wizard but received the error from wizards.js (which is extremely hard to troubleshoot). Clearing your console cache as Zevanty suggests is a great first step. The only other thing that jumps out at me is that your file url was for I:\ which looks like a mapped drive letter. I’d recommend copying the software package to your console locally and trying to build the package from there. Thank you for responding. I am currently doing what you suggested by copying the software package onto the console locally. So far it has helped finish the wizard package and am now deploying it to a test computer. I will keep you updated! The software package is complete, however now when I deploy it, it gets stuck in the “Running” status. When I examine the action info I see that the Prefetch and the Extract are complete but the wait__download… just gets stuck “running”. Below is the whole action script, is it something to do with running it silently? You should run the full command line manually and see what happens. You need to find the correct command-line switches tomake the installer run unattended - i.e. make sure it’s not trying to pop up a dialog to click “ok” or “next”,since the user isn’t going to see that interface.